Electric dryer runs but doesn’t heat. Checked/replaced all the usual suspects. What’s left? dryer runs but doesn’t heat. replaced thermal limit, hi limit, ohmed element o.k., check voltage L1 & L2 o.k., checked voltage on most large wires on timer o.k. timer clicks smooth. What’s next? The example shown is for a Whirlpool dryer but all dryer motors operate similarly. Some centrifugal switches are separately replaceable (like this one); some are not. For an electric dryer no-heat complaint where you’ve checked everything else as you have and still not getting heat, that only leaves a bad centrifugal switch in the dryer motor. 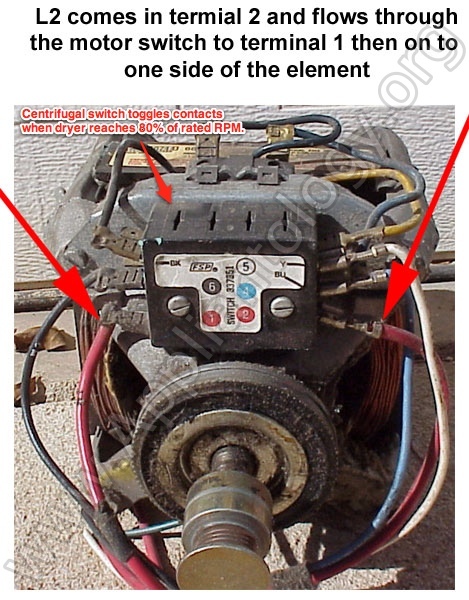 On most models, including yours, that means a new motor because the centrifugal switch is not separately replaceable. This entry was posted in Dryer Repair on April 10, 2012 by Samurai Appliance Repair Man.